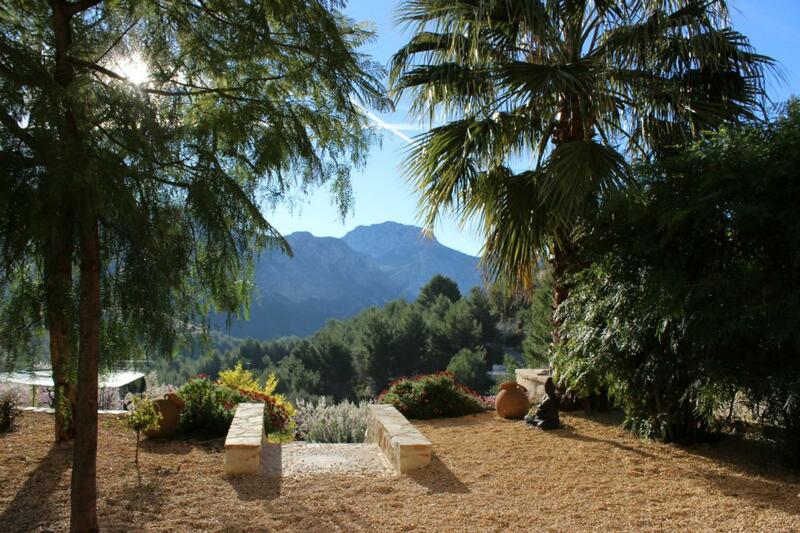 Breathtaking stone finca with 400m² living space and 10500m² property This is a truly spectacular, stone built, private country house with beautifully designed mature gardens and magnificent views of the mountains. 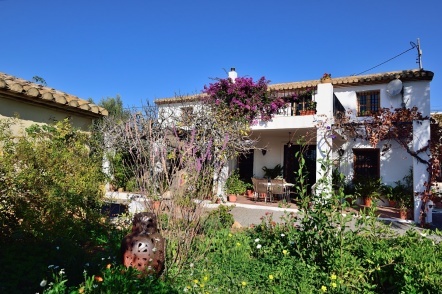 It is situated in the lush green Tárbena valley just a 15 minutes drive from the very traditional Spanish town of Tárbena and just a 30 minutes drive to the coastal towns of Calpe and Altea with their lovely beaches, restaurants and bars. 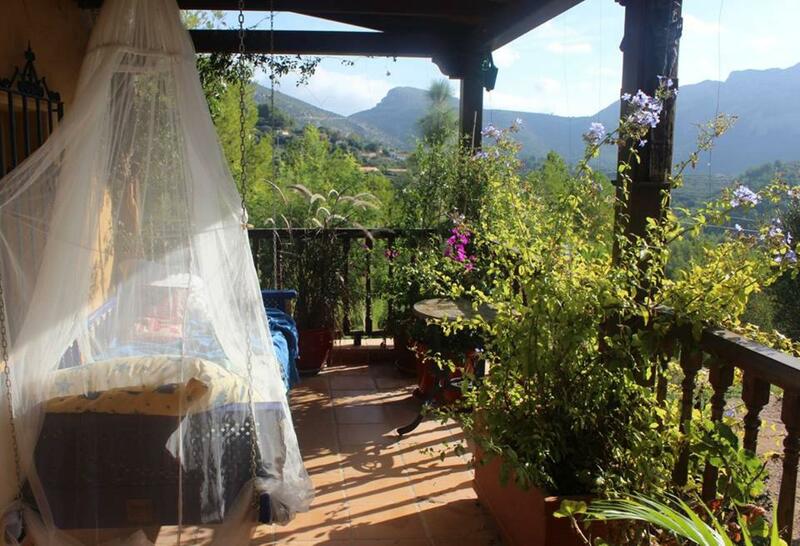 Estudio de Font Blanca is a luxury villa set amidst stunning scenery in a protected mountain area. It is a special place that you fall in love with. 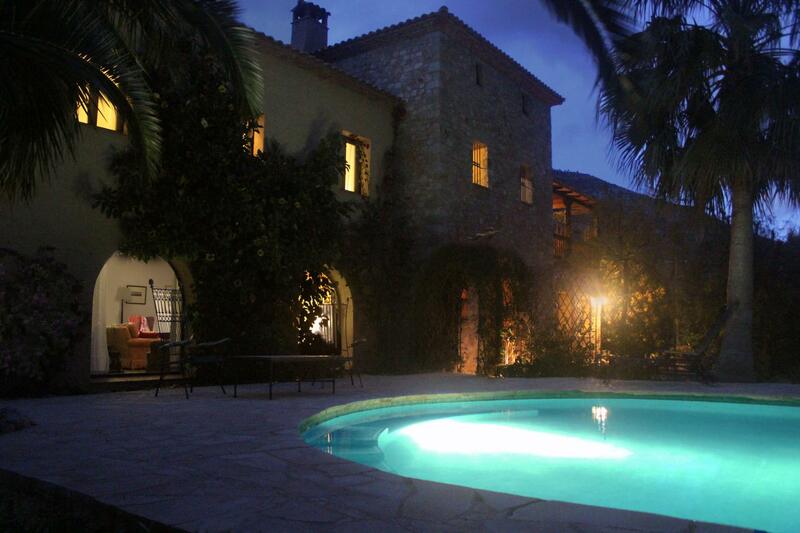 It is a luxury family home but is also large enough to be used as a small hotel. This large house of 400 m2 was designed by and built for an artist and his family and has an atmosphere of quality and sensitivity about it. 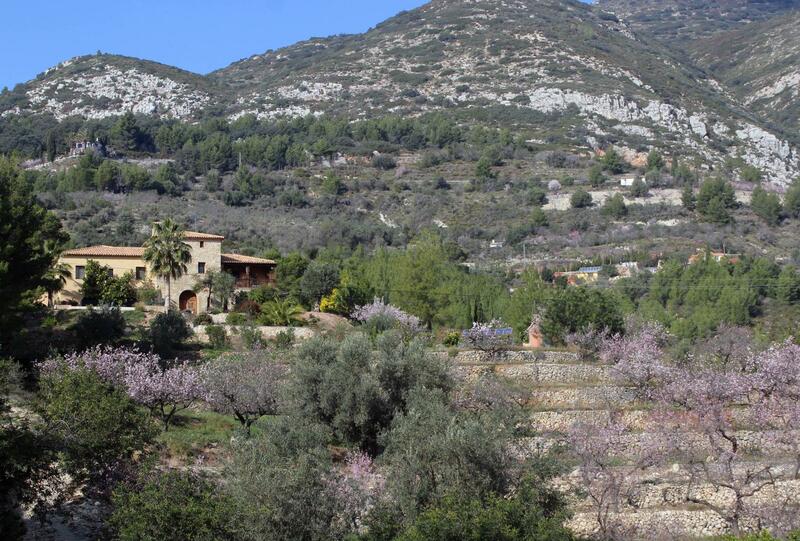 The plot of 10,500m2 is totally private and is terraced with 80 almond trees and a variety of fruit trees. The beautiful gardens totally compliment the house and have a number of unique features. A summer house with wood fired pizza oven plus a separate gas and wood fired BBQ. 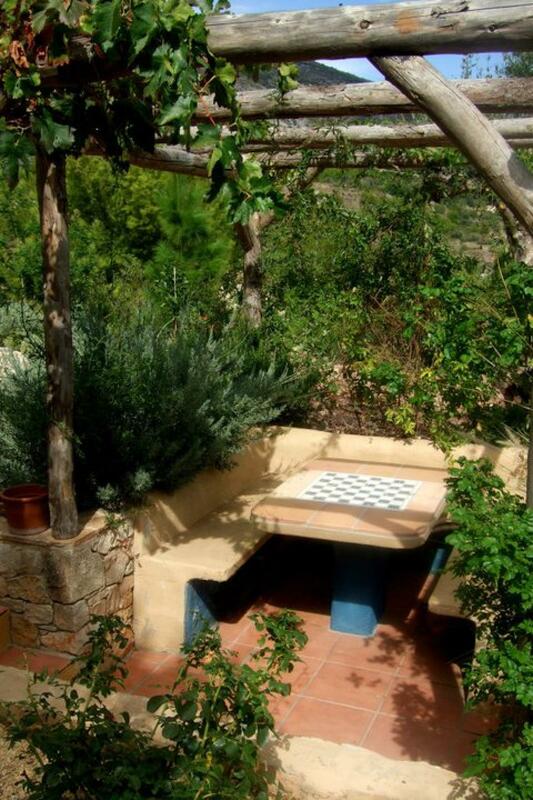 A large unique stone sculpted table under a terrace of climbing bignonia, is perfect for eating al fresco. The infinity pool looks out to the Ferrer and Bernia mountains and is surrounded with ample space for relaxing in the sun. 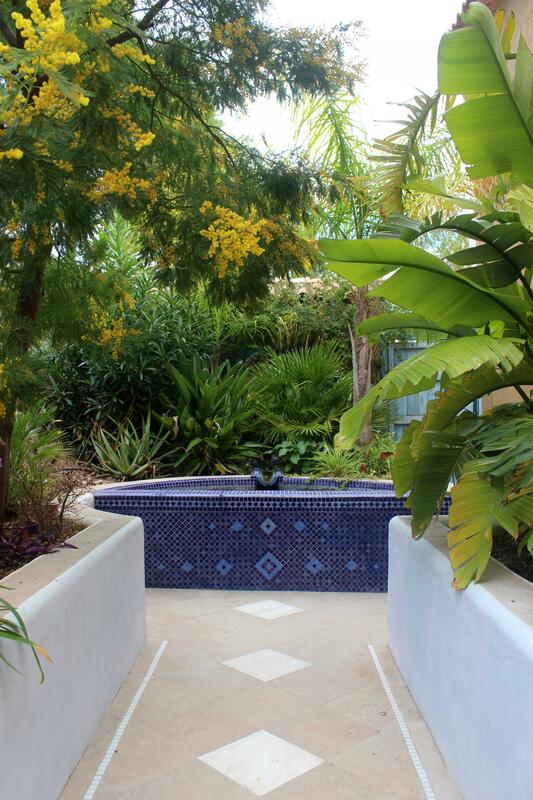 The garden is on two levels and is complete with mature trees, lily pond and plants that provide all year round colour. 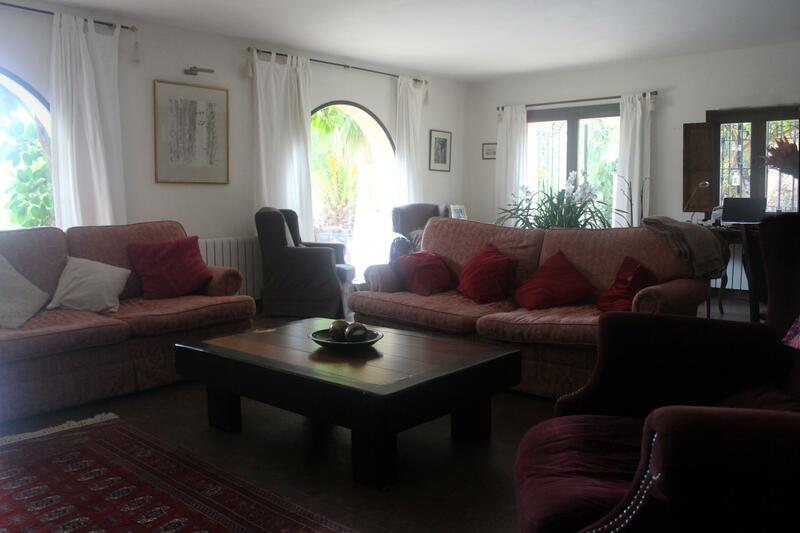 The property is accessed by a 150m private concreted drive and there is ample parking space for 6 cars. 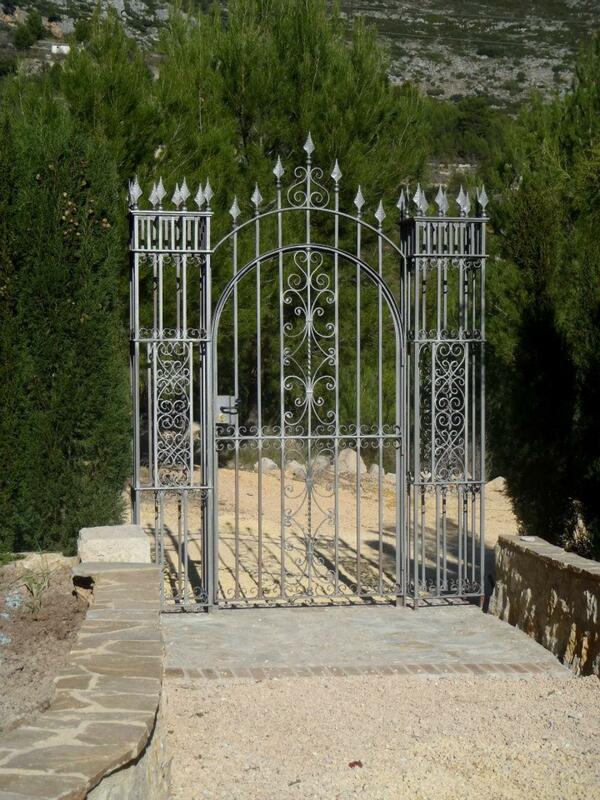 Access to the house and garden is through a unique and ornate wrought iron gate and surround. The house was completed in 2005 to a high specification and designed around traditional antique doors. The construction is of Termoarcilla blocks with an insulated cavity and is part stone built. The foundations are 50cm thick reinforced concrete platform with damproof course throughout with under floor and roof insulation. The large traditional entrance doors lead you into a beautiful large dining hall with marbled Porcelanica tiled floor. The new, double wooden doors made to traditional design lead you right into the kitchen or left into the lounge. At the far end of the room light pours in through the French windows which lead you out into the totally private shade garden. To the right is a cloakroom with WC and washbasin. The generously wide staircase with antique balustrade leads you up to the next floor. Evening meals are wonderful with the large doors open, framing a fantastic view across to the mountains bathed in sunset colours. Turning right through the double doors you enter a 5m x 5m kitchen equipped in a traditional style with a Rangemaster gas/electric cooking range, granite work surfaces and a central table. An arched doorway leads to a 5m x 2m utility room with all the electrical equipment and lots of storage space. The stoneware tiles are laid in a herring bone pattern. A rather special antique door leads you into the garden at the front of the house. To the side of the kitchen there is a small, well maintained herb and salad garden. Turning left out of the dining hall leads you into a large 7m x 5m lounge with built in TV cupboard and book cases and a large, super efficient Dru wood burning stove. The floor is tiled with Porcelenico tiles. French windows lead you out on to a terrace with the large dining table in the shade of the pergola. Here also you have access to the BBQ, garden and wood store. The room is large enough to accommodate two areas; a TV and fire area with large sofas and also a quiet area with writing desk, internet connection and easy chairs. This house was designed to include a painting studio of 7m x 5m which is found at the back of the house and has two separate entrances. One entrance is an antique door at the side of the wood store. 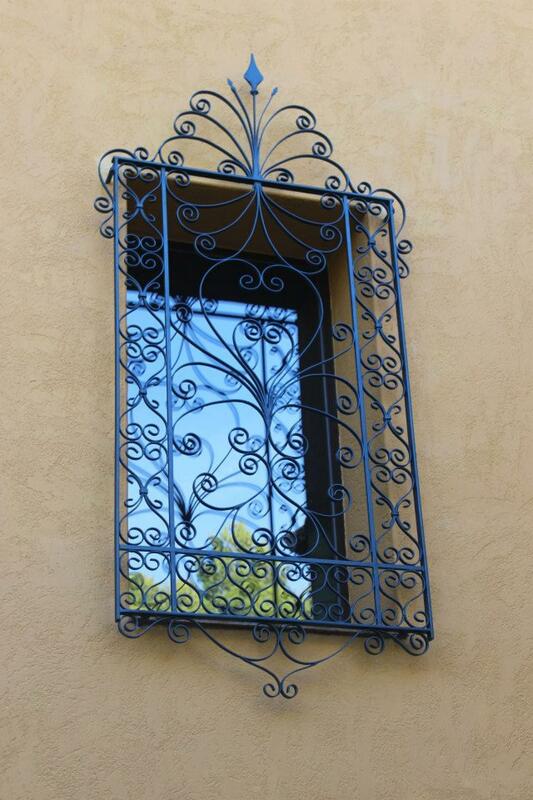 The other is a wall of glass with double doors that open out onto the secluded shade garden. This room has hot and cold running water. This space clearly has great potential for other uses. On the second floor the same floor area is duplicated making a total floor area of 400 m2. It is divided into two distinct areas. 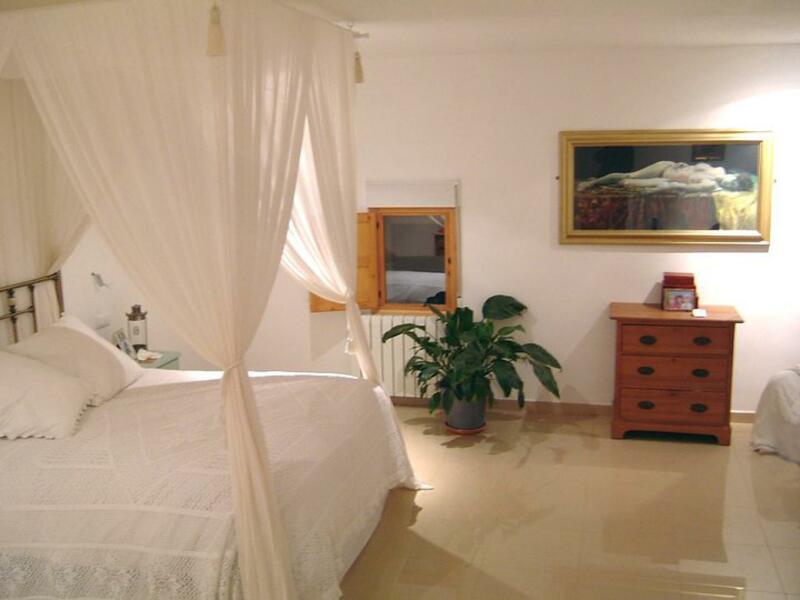 One area is a totally private bedroom suite which includes a 5m x 5m square bedroom which opens out onto a large private covered terrace complete with beautiful flowers and swinging bed. 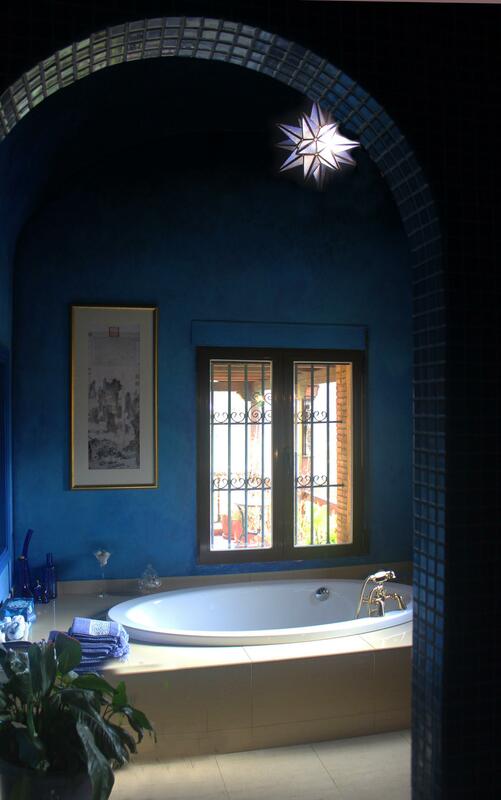 The suite is split level and also contains a separate WC with bidet and washbasin, a walk in wardrobe and a large bathroom in Moroccan style. 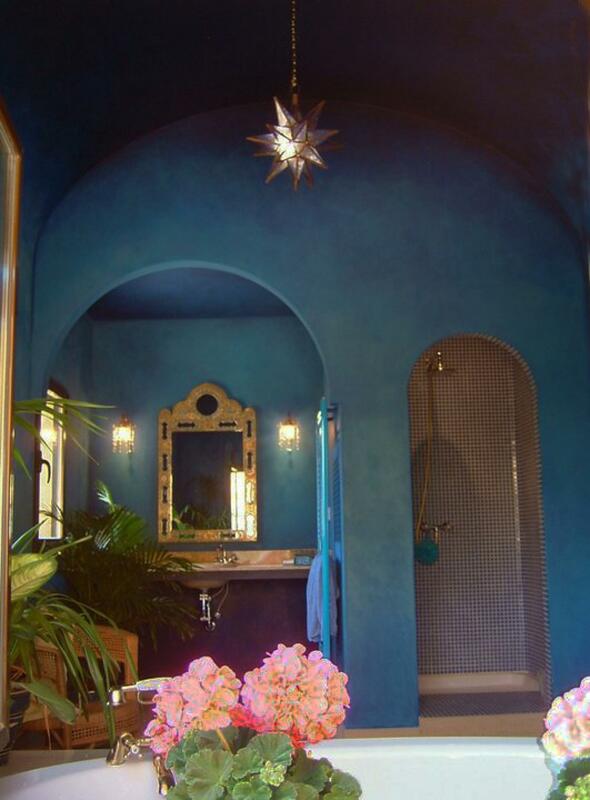 The bathroom has a barrel vaulted ceiling, large walk in shower, large oval bath and a granite topped wash basin area. As you emerge from the suite a flight of spiral stairs takes you up to an attic. It is approx 5m x 5m x 1.2m high and is a superb storage area. Across the landing you enter an area which has 4 bedrooms, a lounge area and small functional kitchen. 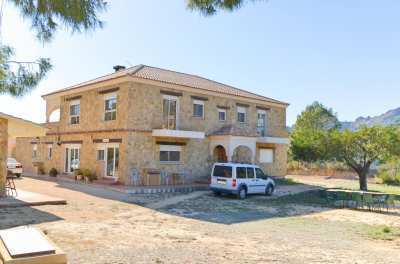 At the front of the house there are two double bedrooms with fantastic views across to the mountains and a shared bathroom. The other two bedrooms are larger and are en suite. There is a separate entrance door with external stairs leading down to the garden. This whole area can be isolated and therefore function as guest bedrooms or as a self contained flat. The studio can accommodate two more bedrooms with bathrooms making a total of seven. 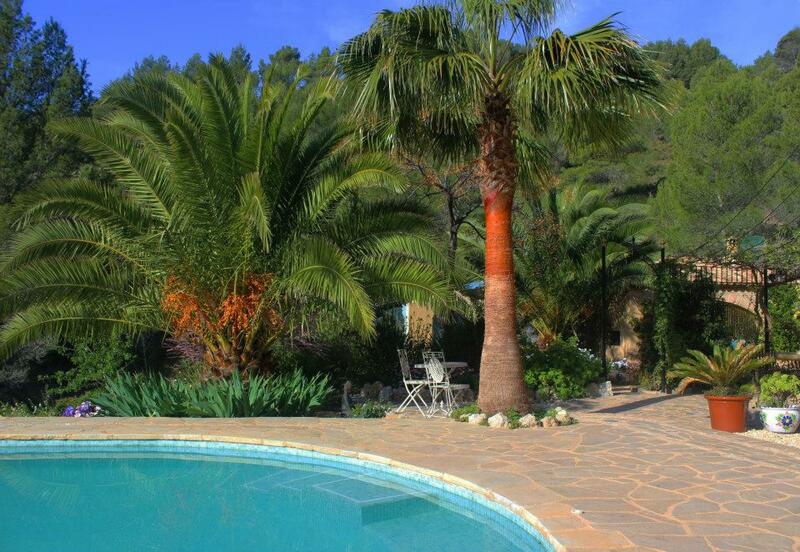 The studio is ideal as it stands, for use as a painting, yoga or meditation retreat. 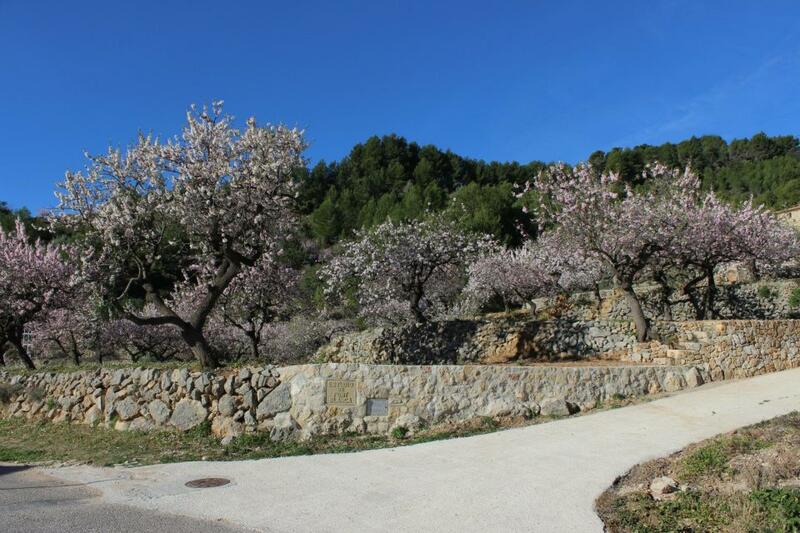 The area is superb for walking, climbing, mountain biking and is famous for its hill climb cycling competitions on the Col de Rates 5 minutes away. It would make an excellent centre for any of these activities. In addition there is a 20 m2 wooden cabin in its own compound presently being used as a sewing studio. Estudio de Font Blanca has great potential. It has mains electricity but also a solar panel system that can satisfy at least 50% of requirements. It has a mains water connection, propane gas central heating, a telephone landline, TV dish and fast internet supplied by satellite. 10 minutes to Tarbena with shopping facilities, pharmacy and primary school. 25km to the famous beaches of Altea or Benidorm. 5 minutes to the Col de Rates with its hiking and climbing trails.